In May-June 1998, a trip to Cyprus to study the Troodos Ophiolite complex was undertaken. As well as studying the Rocks of Cyprus, some sightseeing was also done in the little spare time that there was. Microminerals have been somewhat of an obsession. Check out some of our photographs via 'Micro Minerals". 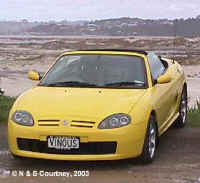 The Trophy Yellow MG TF120 replaced the BRG MGF in June 2003. Check here for pictures and more on MGs. Updated 17 February 2007. What is happening on the farm? Pic of the week at 'Farm pics'. Updated 20 June 2005. Links. Go to Sue's wine site, www.wineoftheweek.com for news and views on wine, restaurants, wine people and books, or the Links page to link to various rock and mineral, Wine, MG and ski sites. We have a slowly increasing collection of postage stamps depicting minerals or rocks. Have a look at 'Stamps'. � All work on this site is copyright to Neil & Sue Courtney. This includes all images that have been taken from the original photos with a digital or still camera.